Players who have been caught botting have had their accounts permanently banned. Please DO NOT BOT. If people whisper you or try to make contact in some ways while you grind, they might be just checking to see if you were botting. Please respond to them to show that you are not a botter. If you didn’t respond, you will lose evidence that you are not a botter. Botting is a permanent ban because not only is it an unfair practice, it is also disrupting the running of the game and the stability & security of the server. Players who afk drill have the tendency to carry a lot of drills in their inventory and then dropping the used-up drills very fast one after another. Please be careful when you drop items to the ground (not just drills but all droppable items). Sometimes, when you drop items, and a notice comes up in the game (for example, notice about fiesta starting or Harkon opening or event monsters appearing during day or night), this may cause a glitch in your item-dropping. For example, instead of dropping a drill, your click may actually end up dropping a legendary unique you have in your inventory. Even when no game notices appearing, fast dropping may cause your client to recognise a different item being clicked on thereby making you drop something you don’t want to drop. Therefore, please drop your items slower, and always re-check to see what items you have actually dropped on the ground. If you dropped an item, this is also tacitly assumed that you do not want those items on your char anymore. Therefore, any nearby chars could pick up your item. Thus, if you actually want to transfer something to another char, it is safer for you to do trade instead of dropping. Once you sold an item to an NPC, that item is deleted from the database. This means that the same item cannot be recovered if you made a mistake. Therefore, please always check the items you sell to NPC to make sure you are not accidentally selling the wrong items. We can argue about what defines “offensive” but if a mod says your name is inappropriate and that you should change it, my advice is please change it. You are responsible to get the Reidentifier to change your name. Do not start bargaining by saying you’ll change your name if we gave you the Reidentifier. A name that is not changed after warning is given will result in a ban. You could appeal for unbanning later but this would still require that you change your name anyway. This means, you lose access to all of your chars and their warehouses in that banned account. Thus, your bannable action done by one char affects the other chars in the same account. Therefore do not say you don’t care about your char getting banned and then later come to me and say you need access to another char in the same account. Even though your ban notice specifies a certain date that your account would be unblocked, this does not work. There is no auto-unbanning. You have to appeal for unbanning. If you didn’t want to have to talk to me about unbanning, do not do anything to get banned in the first place. I have talked about forgetting account emails in other posts before. Forgetting account email is the most serious problem because without it, you cannot recover your username or reset your password. The best thing is simply to remember your username, password, secure code, and lock code; write these information down in a note book somewhere; then you would never need your account email at all. When someone comes to me and say he has forgotten his username and password and that maybe his email were this or this, it tells me that this person does not care enough about that account in the first place to remember or to save its information. Or perhaps that player is trying to steal another player’s account, a player who might have left the game for a while. I don’t have your email records. GM does not give this information out easily, even to me. Therefore, if you have forgotten your account information, and you didn’t have the email to recover the information, my advice is to make a new account if you still wanted play in this server. Do not use randomly generated email or email that you would lose access to some time in the future. For example, do not use your student email at your university to register your game account. One day you will graduate and will no longer have access to that email. Always use email that works, that you could keep and access forever, as your game account’s email. If you lost access to your email or it doesn’t work anymore, it is your responsibility to recover access to it. However, if you have recorded your game account information and remember your username, password, lock code, and secure code, then you really do not need your email. So even if you have lost access to it, you are safe, so there’s that. 9. What are Secure Code and Lock Code? Secure code is the 4-digit number you register when you make a new game account. You cannot change your secure code. It is permanent. You need your secure code to access Auction House on website. If you have forgotten your secure code, you can recover it by using the secure code recovery function on website. If you activated this function, your secure code number will be sent to your game account’s email. This means, you must know your game account’s email (see item 7 and 8 above on the importance of your email). 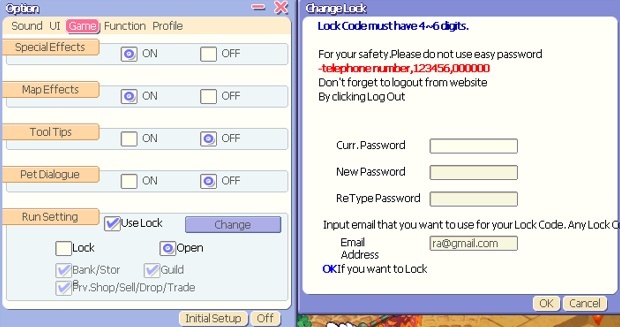 Lock code is the 4 to 6 digit number that you set in game to open your bank, warehouse, to do trades with other players, to drop items, and to trade with NPC. Lock code is not permanent; you can change it any time. In addition, for extra security, you can set a different email for your lock code. If you did this, please do not forget this email either. Or, you could just use the same email for your game account as your lock code email. There are two ways for you to change your lock code: via the website and changing it in game. If you have totally forgotten your lock code, then you use reset lock code function on website. When you use this function, a new lock code will be made for you, and this new lock code will be sent to your lock code email directly. Therefore, you will only know your new lock code number after you have gotten it from your email. Which bring us to this very important point: If you do not have access to your lock code email for whatever reason, please DO NOT use website reset function to change your lock code. 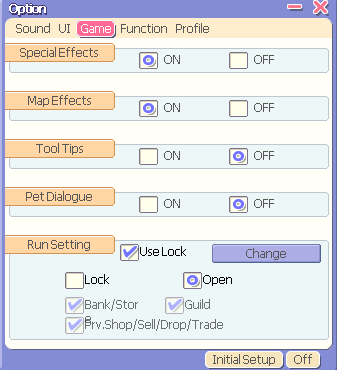 If you knew your lock code but simply want to change it to another number, then use in game change function. Click O (for Option) -- > Game -- > Run Setting -- > Change. To use this function, you must know your current lock code, and the beauty of this function is, you can set your own new lock code number (whereas using website means you get a random number for your lock code). Another nice thing to know here is that you can actually check you current lock code email because it is shown in the Change Lock box (see below). So there is really no excuse for you to say you have forgotten your lock code email. If you have put up items for sale on AH, and then deleting that char that put up the items, please DO NOT cancel your sale. Just go buy those items using chars from your other accounts if you don’t want to lose the items. If you cancelled items that you have put up for sale in AH while the char seller has been deleted, the items will be lost since they no longer have a char to return to. Please do not hoard items in your MyShop inventory. MyShop inventory could accommodate about 300 items at most (probably a little less than this since items from JP, KR, or TH may use up more than one slot count per item). If you did a lot of smelting, take out the boxes you get from time to time so that your MyShop inventory does not break from too many items. If broken, you won’t be able to see any item in your inventory at all. There is no easy way to repair your MyShop inventory if this happened and you may end up not being able to use your MyShop inventory. Sometimes it seems that the item count that you could carry in your inventory is wrong. This may happen because some JP, KR or TH items actually use more than one slot per item. So while your item inventory says you could carry a maximum of 300 items, sometimes your items start disappearing (only invisible, but not lost) when you reach 275, 280 or so. You are therefore advised to not carry too many items on your char. A good check is to go to website and see the inventory on your char. On the website, all items will appear even if you could not see them in your item inventory in game. Thus, you could take them out from your char using the website by putting them up in AH and have another of your char taking them. As I have stated in other posts before, our game files are based on the official Thai TO files. Here's the thing about official Trickster Online games from the different countries that people might not know. Each country customised their TO game. Therefore, the official TO in North America did not have the exact same properties as the TO run in Korea, Japan, or Thailand. While they may have the same name for the same thing (such as skill, box, or item) the thing itself may differ. For example, have you noticed that most pets in North America TO (eTO) had only 1 slot? Also, getting pets from eTO boxes tend to be quite difficult. Now, if you noticed pets from JP, they tend to be 2-3 slots. And it tends to be easier to get pets from JP boxes. KR pets tend to be more skin or model (statless) as also TH pets. And while pets from eTO may be an autoloot, pets from TH tend not to be (even for the same pet, e.g., Sucubbus in TH is not an autoloot pet, but is an autoloot pet in eTO). Items from eTO may also end up a bit different when run through our Thai TO-based files. For example, an eTO item that originally had fixed 3 slots may now have randomised 1-4 slots in our server. This is because that same item in the original Thai TO was a random slot item. Monsters and skills may also differ in terms of resistance and activity. For example, Regent Orcs in our server (based on official Thai TO or tTO) could be killed quite easily using elemental weapons. In eTO, Regent Orcs absorb your element and give it life, making it very difficult to kill using elemental weapon. In term of skills, some skills in eTO that worked in Chaos Tower, for example, don't work here in our tTO-based server. Skills may also have different strengths. Formulas that were used in eTO may not be valid for tTO, or in KR and JP servers. In tTO, items may have randomised slots, while in eTO, they may have the same items fixed to 3 slots. I understand that most of us are familiar with how TO works from the eTO perspective, and humans being a creature of habit, we would like to replicate the exact same thing in this server as per what we had in eTO. Unfortunately, due to the customisations done by the official TO servers themselves, and being that we are tTO-based and not eTO-based (while we also incorporate items from JP and KR, which complicates things further for us), thus we are not able to replicate exactly what we had experienced in eTO. I am afraid that we are not able to do a lot of tweaking for skills in our server. While we have tweaked a lot of items (re-colouring and such), skill is something we are not quite able to tweak just yet. Thus, I appreciate all the skills suggestions we have received thus far, but we are not able to do anything much about them for now. You only need one forum account. If you have registered many accounts, we will approve the first account made. Please use a name with a minimum of four letters in the first name. If you used 3 letters or less, the system has difficulty searching for your name. Please use decent names. I also do not like seeing forum names that are just numbers or random letters. If you have other players in your family who register different accounts in the forum, please inform me (either through forum or in our Facebook group). This is so that I could approve all of the accounts. Usually, I approve only one account per IP address. Please do not change your forum email or attempt to change your name or password. You will end up invalidating your account when you do so. If you needed to change these information, please contact me through the forum. Changing of forum name is not to be done arbitrarily. Once you have used a forum name, you are establishing your presence and identity among the forum community. It is important for the community to have a continuous sense of who’s who populating and posting in the forum. There have been requests made by some forum members to change their forum name. I am usually ok with changing forum names of those who do not actively post in forum (since they are virtually unknown anyway) and I would advise that people actually use their main char’s name (IGN) as their forum name. However, there are those who wished to change forum names simply because they don’t want others to know who they are since they may have behaved badly in game or have engaged in forum drama. This is a poor reason for forum name-changing. The forum is not a witness protection program where you could go incognito and hide who you are after being a douche. So, the point is, don’t be a douche, then you don’t have to hide who you are. Mods will disable your status update capability if you continue to post negative status updates that are deemed inappropriate. Please take note of this, especially those of you who have promised you have changed or will not do it again. Mods may do events in game from time to time and they will use TBNs to run these events. Please do not post your TBN saying they are spamming. I understand that some of you don’t like some of us mods but it is inappropriate for you to accuse mods of TBN spamming while they are running events in game. JP, KR, and TH items, and some custom rTO items may use up more than 1 slot in your char's inventory or in your warehouse, even though the count shows 1 count for that item. As such, some of you may encounter ERR-0021 that causes you to be unable to log in to specific chars. When this happens, use Auction House function to sell items from that overloaded char to another of your char in another account until it is light enough and you can eventually log in to that char. If it were your warehouse (Lovely Angelina) that were overloaded, and you find that you can't open it and instead probably get disconnected, go to Website -- > Manage Account -- > Warehouse Takeout -- > take items out from your char's warehouse. Keep taking out and trying to log in to the warehouse until you have taken out enough and can log in. Please remember that in order to do this, first the relevant char must have enough space in its own item inventory to accommodate all the taken-out items from the warehouse. If your char did not have enough space, you may then encounter Err-0021, which will then necessitate you to do AH selling to your other chars.